with compartments and clips to attach to pram. 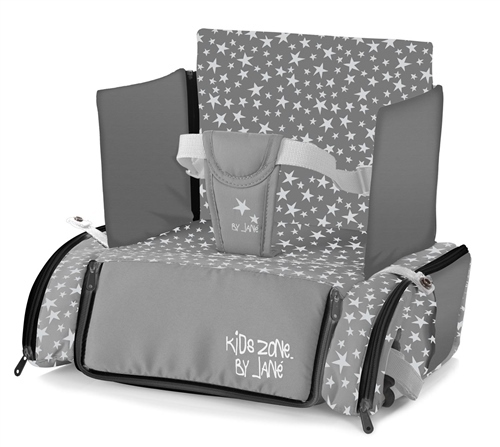 Booster seat-bag with rigid inner structure. Can be fitted onto an adult’s chair and quickly and safely fastened to the seat and the backrest. Padded upholstery. With outer pockets so all the contents can be easily accessed. Suitable from birth as pram bag, and approx 6 months to 3 years as highchair. Quickly and safely fastens onto an adult’s chair by the seat and the backrest. Doesn’t weigh much and takes up very little space.